We're in the middle of our first heat wave of the season. This week the temps are topping out in the 90's for several days in a row. Anyone who thinks that living "up north" translates to cool summers would be in for a surprise. As the saying goes: "It's not the heat, it's the humidity". Midwesterners, and particularly the hardy stock of Scandinavians I grew up with, tend to harbor a certain smugness about being tough enough to handle anything life throws at us, particularly when it comes to weather. If it doesn't kill you it makes you stronger, and all that. We never had air conditioning when I was growing up. Our only concession to the heat was a single box fan to help cool a 4-bedroom two story house (and pitchers of icy Kool-Aid). During the day the fan would be placed downstairs, usually in the dining room, which was centrally located to the other rooms. If my mother was working in the kitchen cooking or ironing it might navigate closer to the kitchen door. Anyone caught standing in front of the fan would get complaints about blocking the air. I used to sometimes cool off by going down to the unfinished basement, the coolest spot in the house, where I'd unfold one of our outdoor webbed lounge chairs, stretch out, and get lost in a book. My grandmother, however, would always admonish me not to sit too close to the block walls. She was convinced that doing so would give me tuberculosis! Her line of reasoning? Her younger sister had come down with TB not long after she had been sitting against a cool wall on a hot day. The fact that TB had pretty much been eradicated by my time didn't matter. At night my parents always took the box fan into their bedroom. They would put it in the window, directed to expel the hot air outside, telling us kids that we would all be cooler because it would create cross ventilation. With my bedroom out the hall and around the corner it wasn't much, if any, help. At the very least the noisy rattling fan would eventually lull me into a hot fitful sleep. On nights when it was just too unbearable we'd take our blankets and pillows downstairs to camp out on the living room floor. I can see why many old houses back then had screened sleeping porches. The house I live in now has central air and it's been a luxury I never take for granted. We lived with fans and a window air conditioner for at least ten years before we finally decided it would be money well spent to upgrade to a central system. I like to tell my husband that a happy wife is a happy life. Haha. I'm miserable and miserable to live with when the weather gets hot. 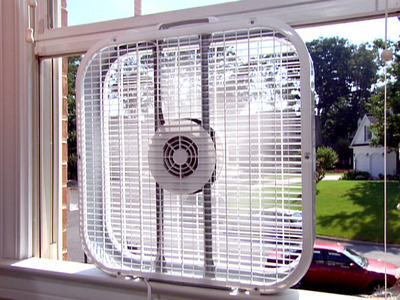 Do you use a box fan to keep cool? The other day I ran across this tutorial on how to revamp a box fan over at Instructables. It's so pretty. So much better than utilitarian gray or beige. It not only is cool it looks cool. It almost makes me want to dig out our old fan from wherever it's buried in the basement and give it a new life. But I won't be shutting off the AC! At least the hot weather doesn't last too long here in the upper midwestern states. While out doing errands this morning I noticed the big box stores are already stocking their shelves with back to school supplies. Soon enough we'll be digging out the sweaters and scarves again. How do you keep your house cool in the summer heat? Tough it out? Window AC and strategically placed fans? Central air? Gallons of cool drinks?